Budget cuts have forced the Lester B. Pearson School Board to lay off 18 librarians. The cuts are equivalent to nine full-time positions, because some librarians only worked one or two days a week. The lay offs were brought on by the Quebec government's announcement it was cutting the board's budget by nearly $4 million for the 2015-2016 school year. LBPSB Chairperson Suanne Stein Day said that the board was one of the last to keep those sorts of jobs, but had no choice but to make the cuts. Librarians aren’t the only employees seeing their positions being cut; Stein Day said seven support staff positions in the head office are also gone. “People are the most important things to us and we’re going to do everything possible, but we’re running out of options,” she said. The hope is that parent volunteers who work in the library will help out more regularly, though Stein Day acknowledged they can’t completely replace the trained professionals who are now out of jobs. Anita Nenadovich, president of the independent union representing support staff, said she is not impressed with that new educational standard. “Last time I looked, parents send their children to school to be educated by qualified staff, support staff, teachers, the team, not by volunteers,” she said. Librarian Kathleen Conroy said she’s devastated by the decision and thinks it’s a setback for the board. In addition to helping foster a love to read in young students, librarians also teach kids about digital citizenship, copyright laws and plagiarism. 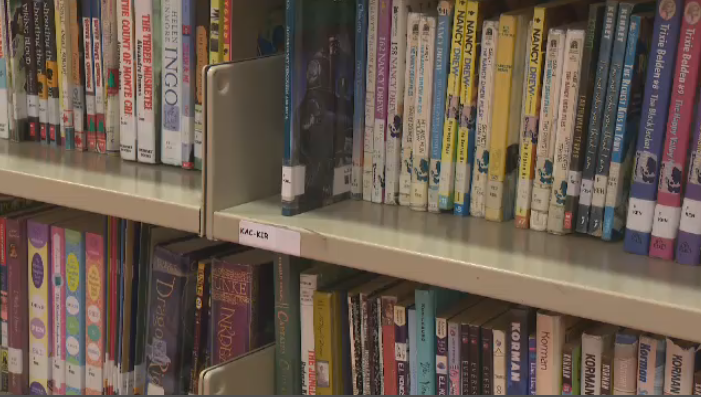 The English Montreal School Board will also have to find ways to cut millions of dollars, but says it does not plan to cut its elementary school librarians. "I see us falling back into the dark ages. How can you give up on your school library?" Conroy said. Books on a shelf at Allion Elementary School in LaSalle. The Lester B. Pearson School Board has laid off 18 of its librarians.